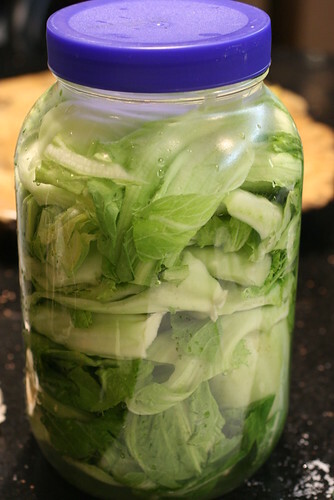 Pickled Mustard Greens, or Swan Tsai, are a traditional Chinese favorite. They’re the sour chopped veggies you get in the Beef Noodle Soup (if you get an authentic one) or in Taiwanese dishes like Minced Pork Rice or Pork Chop Rice. Oh, I also love when they are sauteed with squid. 1. Get a large clean jar (with lid). Clean the mustard greens very thoroughly by rinsing with water and rubbing the dirt off with your fingers. 2. Press a few leaves into the jar, sprinkle with table salt, press another couple of leaves, sprinkle with table salt. Repeat until you reach the top, making sure to pack in tightly. Fill the jar with water and top with about a tablespoon of white vinegar. This is just to prevent mold. Cover tightly. 3. Bring it over to the sink and turn it upside down 2 or 3 times. 4. Now just let it sit. In warm weather, it will only take a few days. In the winter, it will take up to 9 days. It all depends on your room temperature.